This second App4Sales Training explains how customers can be viewed and managed within the App4Sales application. Thanks to the connection with the App4Sales CMS and your backoffice, you can always see the most recent customer base. Via the main menu, you can easily open the full customer overview by pressing the button: “Customers”. A list of customer data will appear within the sales application. Customers will have the company name, visiting address, and customer number from your backoffice. If you are using the online mode of App4Sales, a map will be displayed on which you can see the location of all your customers. New customers are created from the main menu, the new customer is synchronised with your backoffice and appears in your customer database. You can immediately start writing an order for your new customer. With this digital order processing, you can prevent errors in your backoffice and save time. From your customer overview, you can see detailed information by opening a customer. 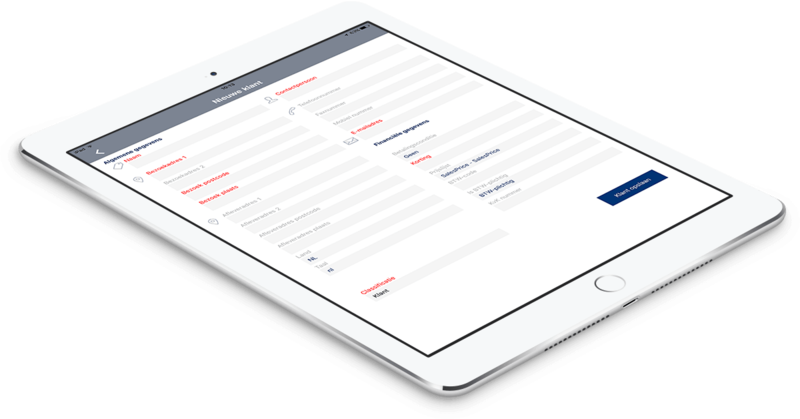 The customer card of the sales app includes information such as the phone number, e-mail information, and the contact persons. You can view the order history of the customer and you can immediately start writing a new order. You can easily add notes to the customer, which you can view within the AppSales CMS. Navigate to your customer easily by using the integration with Google Maps. By pressing the button: “Nearby customers” in the main menu, you can immediately see what customers are near your current location. If you have visited a customer, you can easily see what other customers are in your vicinity. You then select the customer from the customer list and start navigating from the customer card. Representatives can use this for even more efficient sales with the sales application and to realise customer visits.